We are lucky to have good bagels around here. Our local bagel store used to be owned by a woman who I called the “Bagel B____ (rhymes with witch),” or BB, for short. I’m pretty sure I’m not the only person who called her that. God, she was vile. I worked with NYSE floor traders who had more patience than this woman. And I was (for the most part) a very good, very efficient bagel orderer. 99% of the time I knew exactly what I wanted and spoke in a clear, concise fashion with no dilly dallying, and she was still miserable and rude. Fortunately, a much nicer man has since bought the store, and I am now safe to modify my order without BB’s scorn. I am so very proud of myself. Yesterday I made bagels for the first time and homemade butter for the second time. Both were surprisingly easy. Luisa, my favorite food blogger at The Wednesday Chef, shared Peter Reinhart’s Amazing and Almost Idiot-Proof Recipe, and I was inspired to try myself. 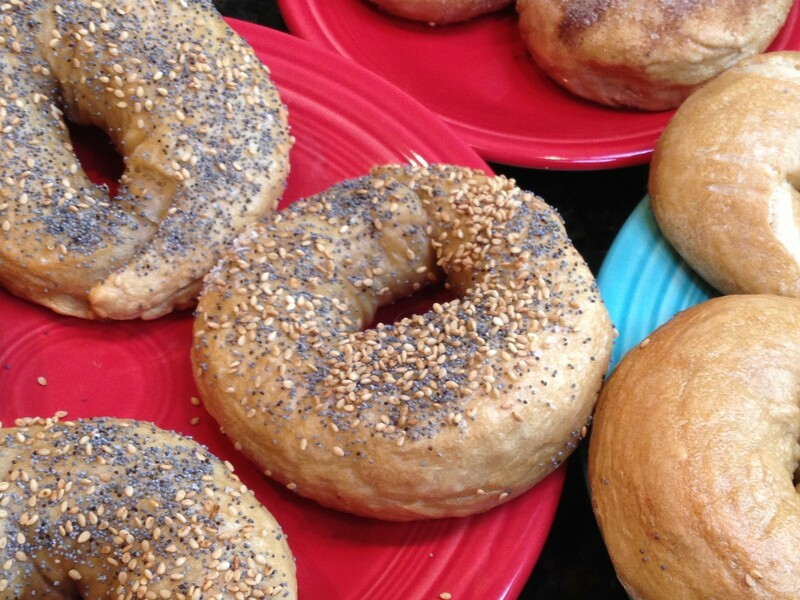 Assuming I can keep up with a good workout schedule, I am thinking of making bagels weekly. Or, at least, monthly. In any event, they are so good that I am already dreaming of next time. 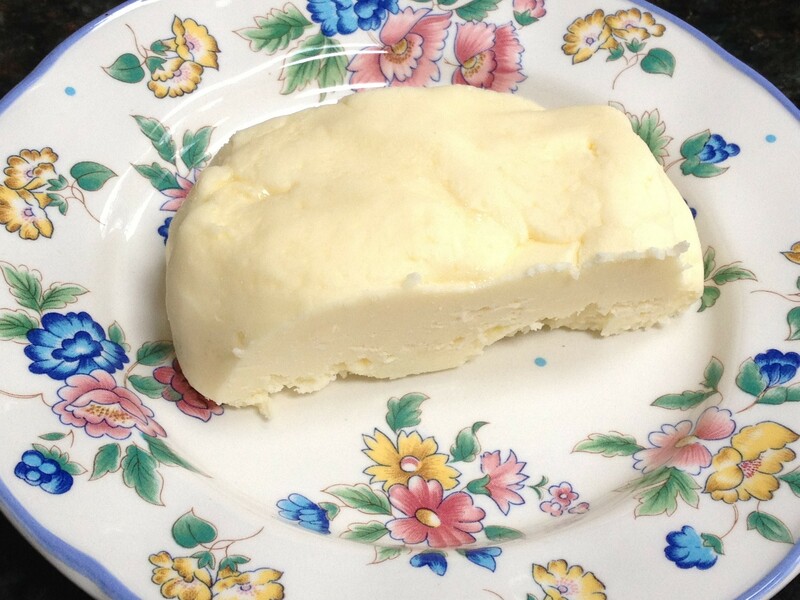 The butter I made on a whim, after reading an article in Fancy Fine Cooking. I just felt like my special bagels deserved good butter. Plus, I’m kind of a show-off. Two pieces of advice: DOUBLE THIS RECIPE! I made seven bagels, and in retrospect, I wish I would have made six larger ones instead. Twelve decent sized bagels instead of seven smaller ones would have been perfect. And start this recipe ONE DAY BEFORE you want to eat bagels (see step 7: refrigerate overnight). Note: Barley malt, also known as barley malt syrup, is generally available at health food stores including Erewhon Natural Foods in Los Angeles and Granny’s Pantry in Pasadena, as well as at most Whole Foods Market stores. Instant yeast is generally available at cooking and baking supply stores. Despite the short work time, this recipe takes two days to make because of the rising time. If you make more than 6 bagels, you may need to prepare 2 baking sheets. Toppings can include poppy or sesame seeds, coarse salt, dehydrated onion or garlic bits that have been soaked, and cinnamon sugar. 1. In the bowl of an electric mixer or food processor or by hand, mix the flour, 2 teaspoons salt, the yeast, barley malt syrup and 1 cup plus 2 tablespoons water until the ingredients form a stiff, coarse ball of dough (about 3 minutes if mixing by hand or in a mixer; or 1 minute in a food processor). If necessary, add a little more water. Let the dough rest 5 minutes. 2. Knead the dough on a lightly floured surface until the dough feels stiff yet supple, with a satiny, slightly tacky feel, 2 to 3 minutes. If the dough seems too soft or too tacky, sprinkle over just enough flour as needed. 3. Place the dough in a lightly oiled bowl, cover tightly with plastic wrap, and place it in the refrigerator for at least 1 hour and up to several hours. Keep in mind that the bagels must be shaped before proofing overnight. 4. When ready to shape the bagels, line a baking sheet with lightly greased parchment paper or a silicone baking mat. 5. Remove the dough from the refrigerator and divide it into 6 to 8 equal pieces. Form each piece into a loose, round ball by rolling it on a clean, dry work surface with a cupped hand; do not use any flour on the surface. If the dough slides around and won’t ball up, wipe the work surface with a damp paper towel and try again — the slight amount of moisture will provide enough “bite” for the dough to form a ball. When each piece has been formed into a ball, you are ready to shape the bagels. 6. 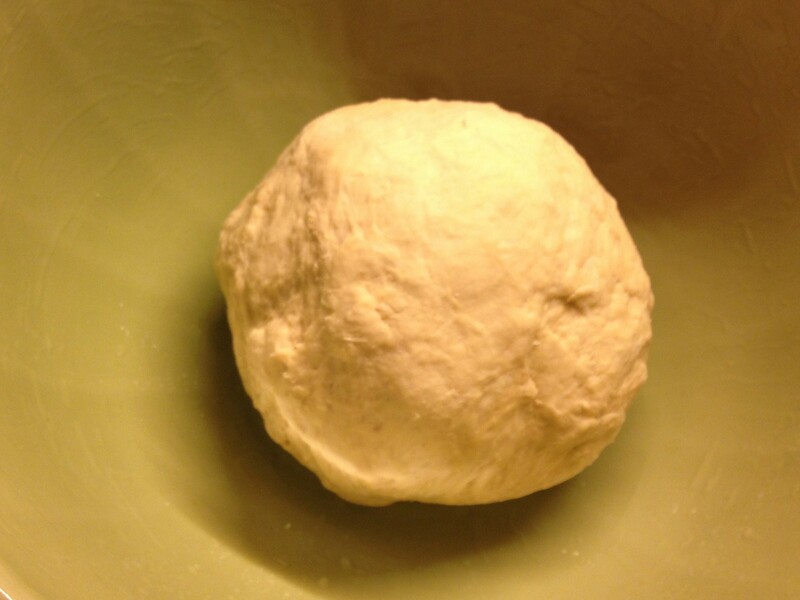 Using your hands and a fair amount of pressure, roll each dough ball into a “rope” 8 to 10 inches long. (Moisten the work surface with a damp paper towel, if necessary, to get the necessary bite or friction). Slightly taper the rope at the ends so that they are thinner than the middle. Place one end of the dough between your thumb and forefinger and wrap it around your hand until the ends overlap in your palm; they should overlap by about 2 inches. Squeeze the overlapping ends together and then press the joined ends into the work surface, rolling them back and forth a few times until they are completely sealed. 7. Remove the dough from your hand and squeeze as necessary to even out the thickness so that there is a 2-inch hole in the center. Place the bagel on the prepared sheet pan. Repeat with the other pieces. Lightly wipe the bagels with oil, cover with plastic wrap and place in the refrigerator overnight. 8. 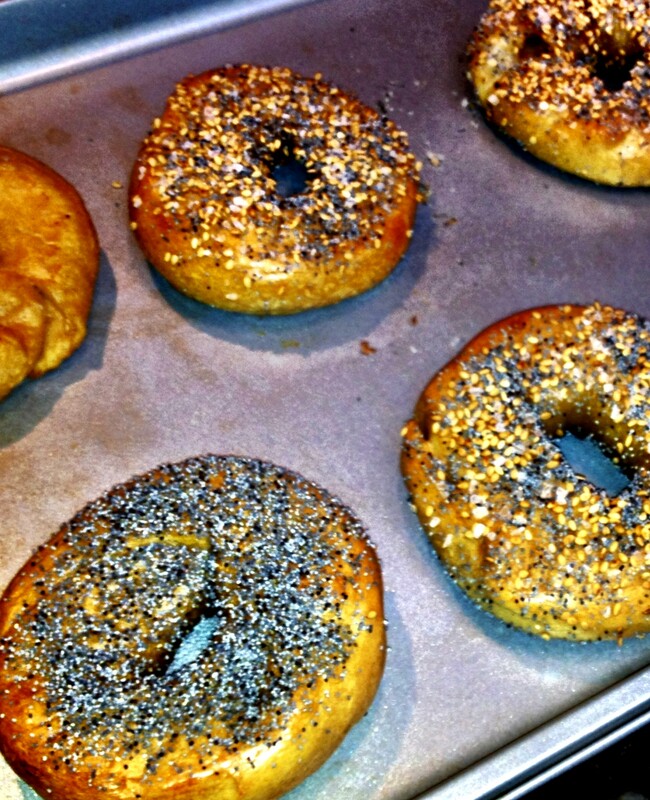 Remove the bagels from the refrigerator 90 minutes before you plan to bake them. Fill a large stockpot with 3 quarts of water (be sure the water is at least 4 inches deep), cover with a lid, and slowly bring the water to a boil. When it comes to a boil, add the remaining teaspoon of salt and 1 teaspoon of baking soda, reduce the heat and simmer with the lid on. 9. Thirty minutes before baking, heat the oven to 500 degrees. 10. Test the bagels by placing one in a bowl of cold water. If it sinks and doesn’t float to the surface, return it to the sheet, wait 15 minutes and then test it again. When one bagel passes the float test, they are ready for the pot. 11. Gently lift each bagel and drop it into the simmering water. Add as many as will comfortably fit in the pot. After 1 minute, use a slotted spoon to flip each bagel over. Poach for an extra 30 seconds. Using the slotted spoon, remove each bagel and return it to the lined baking sheet. Continue until all the bagels have been poached. Generously sprinkle each bagel with a topping, except for cinnamon sugar (see note below). 12. Place the baking sheet in the oven and reduce the heat to 450 degrees. Bake for 8 minutes and then rotate the sheet (if using two sheets, also switch their positions). Check the underside of the bagels. If they are getting too dark, place another sheet under the baking sheet (i.e., double-pan it). 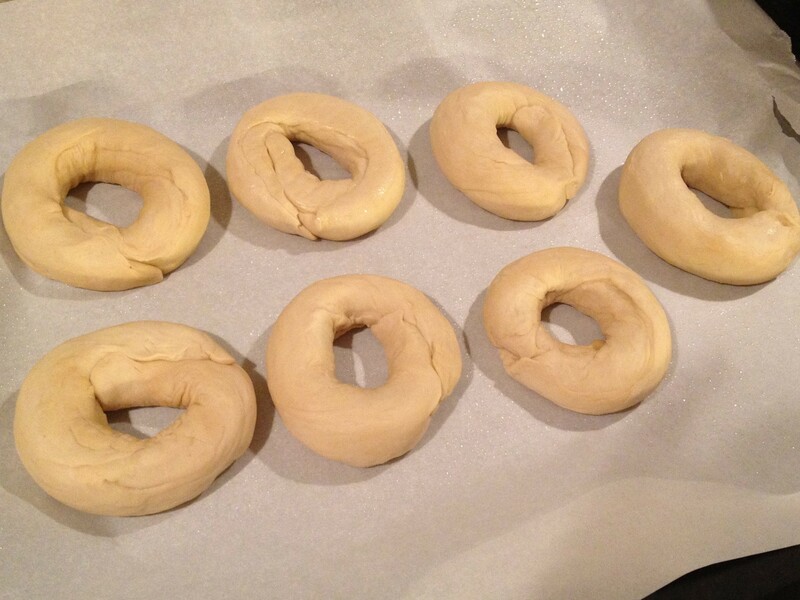 Bake until the bagels are golden brown, an additional 8 to 12 minutes. Remove from the oven and transfer the bagels to a rack for at least 30 minutes before serving. Note: If using cinnamon sugar (1 part cinnamon to 5 parts granulated sugar), immediately brush the top of each hot bagel with melted butter and then generously sprinkle with the mixture so that it is coated. It will form a nice cinnamon crust as it cools. Each of 8 servings: 226 calories; 7 grams protein; 46 grams carbohydrates; 2 grams fiber; 1 gram fat; 0 saturated fat; 0 cholesterol; 1,031 mg. sodium. In a stand mixer fitted with the whisk attachment, whip 2 cups of heavy cream on medium speed until medium peaks form, about 3 minutes. 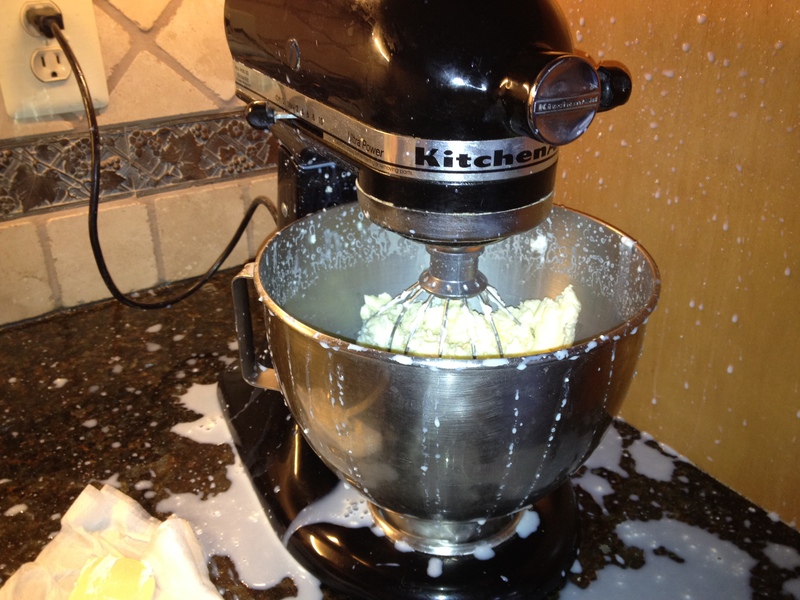 Put a splatter guard on the bowl or drape a kitchen towel over the mixer and the bowl. Increase the speed to high and continue whipping until the solids separate from the buttermilk (you will hear sloshing), about 8 minutes. Gather the butter into a ball and put it in a strainer. Rinse under cold water, squeezing with your hands, until the water runs clear, about 1 minute. Knead in 1/4 tsp. sea or kosher salt and shape the butter as you like. Pat it dry with a paper towel, wrap in plastic, and refrigerate for up to a month. 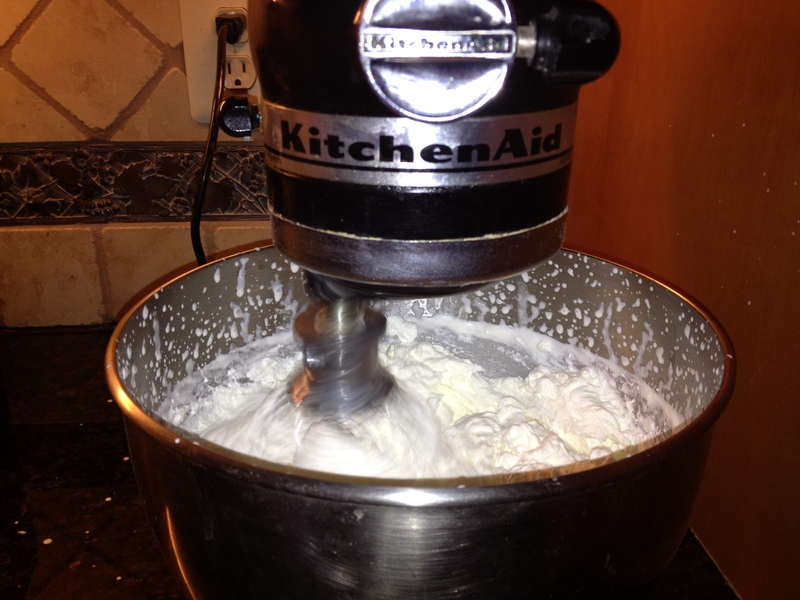 Notes from Dawn: This is obviously super easy as long as you have a heavy duty mixer. 8 minutes is a long time to run a mixer not equipped for such work, so make sure your mixer is up to this task. It is also quite a mess. TOTALLY worth it, but be prepared to clean up a bit. You’re probably thinking the picture below is not such a mess and I must be a total princess. Oh, you just wait! This is only the first part where it’s still glorified whipped cream. Okay, was I lying? Isn’t that awful? But the final product is so delicious and the perfect accompaniment to fresh baked bagels or bread. Voila! This entry was posted in Main Dish, Side Dish and tagged homemade bagels, homemade butter by Mom Mom's Apron. Bookmark the permalink. Jay and I were really excited about the homemade butter but Jay apologizes that he could not gather much enthusiasm over the homemade bagels. I think we can excuse him because he made and sold bagels at Einstein from 2001-2004 with barely one day off a week and many, many, many (I don’t think I can type enough manys but you get the idea) double shifts (dang kids who call in sick). Claire, I totally forgot you are married to a bagel expert! Can you ask Jay how I would make jalapeno cheddar? Or chocolate chip? The dough is so stiff and I’m not sure how easily those extra elements will incorporate into it. Thanks! Also, if you make the butter, DO use a dish towel over your mixer as suggested. That probably won’t eliminate the mess but you’ll have a little less of a cleanup than I did! The bagels look amazing. But the mess from the butter makes me want to make it in the house for sale next door. A smarter person might have put a kitchen towel over the mixer like the recipe suggested! and we also get fresh buttermilk as part of the process?